After a weekend of many Premier League debuts, Antonio Conte’s first match in English football was reserved for Monday night, as Chelsea hosted West Ham who started with Dimitri Payet on the bench. With the ball, Conte’s side showed the same focus on attacking through the wide spaces which had been one of the biggest changes seen in the pre-season matches. When in sustained possession, they would patiently move the ball from side to side, looking to penetrate the wing-spaces with vertical passes and wouldn’t often attempt to progress through the centre. Tailored towards this wing-focused passing was Chelsea’s positional structure. From a base formation of something between a 4-2-3-1 and a 4-3-3, both wide players would stay fairly close to their touchlines whilst Oscar had a tendency to drop into the right half-space. This formed some clear partnerships through the lateral areas of the pitch, with a triangle of Ivanovic, Willian and Oscar combining down the right and a more linear Hazard – Azpilicueta duo forming on the opposite side. 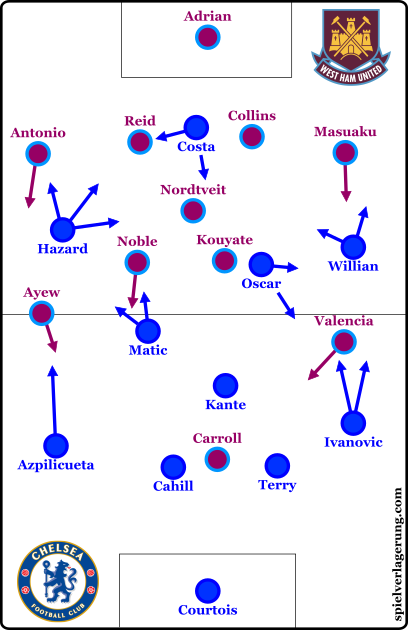 In deeper positions, neither Matic nor Kanté looked to consistently take up positions higher in the midfield and a ‘U’ shape began to form. Chelsea’s positional structure in possession. As a result of this wing-oriented positional structure, Chelsea didn’t often look to occupy spaces higher up in the midfield. Their ball circulation was largely horizontal (until the more progressive-ball movement in the wider areas) and without attempting to move the ball upwards through the centre, there wasn’t a great need for the attacking midfield areas to be taken up. Their spacing in possession was effective for the most part simply because it suited their attacking strategy of penetrating and combining down the flanks. Although it limited their variability to some degree, the open 10 space wasn’t very restrictive and their increased number of players down the flanks made for some threatening attacks. In order to bridge these attacks, short passes along the deeper chain involving Kanté and Matic (as well as the deeper-moving Oscar) was an often-used means of moving the ball from one flank to the other. Although not necessarily ideal, it was a simple and easy means of re-circulating the ball back inside. The lack of pressure from West Ham’s more passive mid-block made for little challenge during these moments and Chelsea were fairly comfortable. 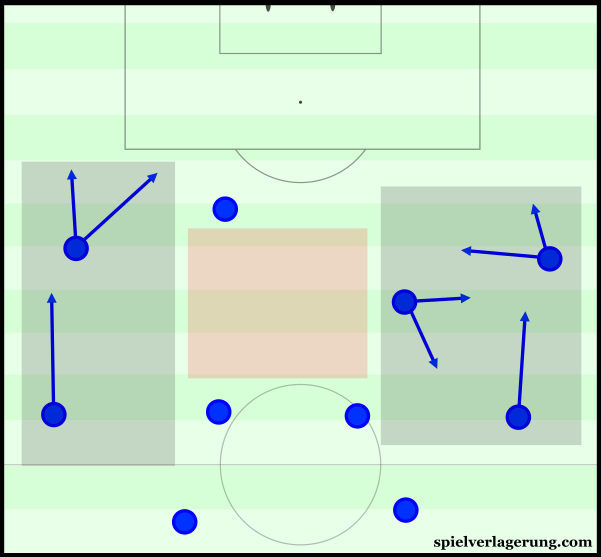 Aside from these shorter-passing switches, Chelsea also made quite a high number of long direct switches from flank to flank. When in more advanced positions where moving the ball back to switch through the midfield was not ideal, the wide players would look to hit direct passes to their teammates on the opposing touchline. Due to the slightly differing micro-structures and player profiles found on the flanks, Chelsea’s attacking strategy had some asymmetry between the two sides of the pitch. Down the right side, the profiles of Oscar, Willian and Ivanovic made for more combinative plays with Willian in particular a key figure in bringing his teammates into action. The trio often made small triangles between each other and a number of fast passing exchanges were made through this to break open West Ham’s defence. It was a small 1-2 between Ivanovic and Oscar which led to the former’s chance in the 12 minute, as his low shot to the right corner was saved well by Adrian. Aside from these small combinations, Chelsea quite commonly made crosses from deep positions in an attempt to create chances for Costa in the middle. However this tactic wasn’t very effective, with the angle and pace of the cross making it a generally difficult way of making clean goalscoring chances. From such an angle, it’s difficult for the crosser to deliver the ball to the strikers where they can run onto the ball due to the amount of curl necessary. On the opposite side of the pitch, we saw some rather contrasting dynamics between Hazard and Azpilicueta. For a start, the fact that there wasn’t always a 3rd player joining the attacks meant that combinations were harder to form and would be more linear. Their inability to create triangles made combinations more difficult to form and thus it wasn’t a big part of their attacking tactics. In addition to this, Hazard is more of an individualistic player when compared to Oscar and Willian, preferring to make his aggressive slaloming runs at the opposition defence. Hazard’s 12 dribbles, notice the diagonal focus from the wing through the half-space, directly to goal. As a result, Chelsea’s attacking play down the left was much more based around individual actions. There was a greater priority on giving Hazard the ball to his feet, where he could turn and dribbling diagonally through the left half-space between small gaps of West Ham midfielders and defenders. With his direct opponent being an unnatural full-back in Michail Antonio, Hazard enjoyed some success going forward in a performance more reminiscent of his football before last year. Despite having a clear plan and executing it fairly well during the match, it must be said that Chelsea struggled to create much against West Ham’s defence. Aside from the penalty, they generated 0.8 (of Caley’s model) expected goals throughout the game which is perhaps slightly sub-par for a team of Chelsea’s quality. Aside from individual issues, West Ham defended fairly well. They used a compact 4-1-4-1 defensive block which saw 10 men behind the ball when defending their own half. 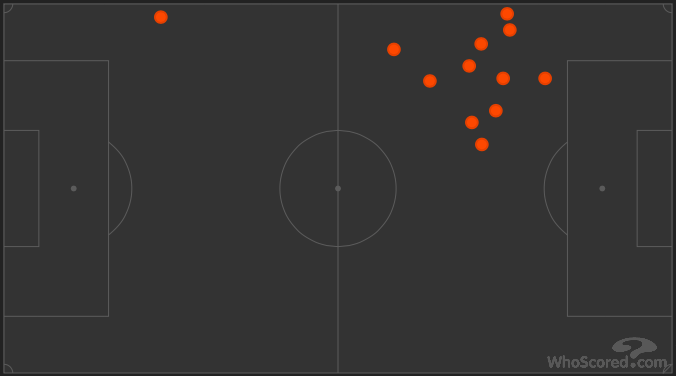 They blocked the majority of Chelsea’s crosses well and used the low-block to good effect for the most part. Chelsea had some issues of their own too. The wide-nature of the attacks made it difficult at times to create good chances, as they were trying to create from positions further away from the goal as well as in a lesser amount of space compared to more central positions. The deep crossing from the right flank came to little fruition whilst the left side was somewhat reliant on Hazard. There was a slight difference between what we saw Chelsea’s attacking game in pre-season and how they faired in their first Premier League outing. Although the flanks were also their focal point in the friendlies, their attacking was much more patterned and pre-planned with some clear movement schemes to be seen. Upon a vertical pass into the ball-near forward, it was common to see the winger making an inside movement around the front of the forward where he could receive the ball and drive it forwards. It was a frequently-used pattern which was obviously one practiced in training. A common movement pattern seen in pre-season. Thanks to JD for the .gif. However in their Premier League opener, we saw no such patterned attacking. Instead, Chelsea’s movements were more variable and improvised depending on reference points such as the positioning of teammates. This may have been due to the lack of a second striker, meaning the initial ball into the forward was difficult to establish due to Oscar’s deeper positioning. Another explanation could be that Conte did not feel such patterns were being executed at a level sufficient for competitive football yet, meaning it could be something we see further down the line. Instead, more basic patterns were used such as overlaps by Ivanovic whilst Willian moved inside. Such movements were fairly effective in momentarily creating space for the free man where they could play crosses into the box. Neither team approached their defensive game with a great intensity, preferring to sit in deeper mid-low blocks and not challenge the opposition within their own third. In Chelsea’s case, they used a defence which could shift between a 4-5-1 and a 4-4-2/1-1 depending on the orientation of Oscar at the time. They kept a generally low defensive line which suited the nature of Terry and Cahill in the centre-back pairing and generally looked to defend their own half throughout the game. During West Ham’s build-up, they would adopt a slightly more advanced position in order to force their long balls from deeper positions, meaning that Carroll would be further away from Chelsea’s box and thus less of a threat. Most of the time, this could be done by just Oscar and Costa. Their compactness was improved from last season, though not at ideal levels (yet). Vertically there was little space between the midfield and defence, which helped in their attempts at defending West Ham’s direct possession game quite well. However, due to the wider orientation of the wingers, their horizontal compactness was lacking at times within the final third. Thankfully for them, West Ham’s attacking was unable to expose these gaps, especially for the first 67 minutes when they were without the talismanic Dimitri Payet. Creating just 0.4 expected goals throughout the 90 minutes, West Ham didn’t carry much of a threat in attack. Evidently missing the man who carried them at times last year, their game was predictable and rather linear as seemingly their only plan at times involved long balls to Andy Carroll. Whilst Chelsea defended fairly well, West Ham weren’t exactly causing them any trouble. They generated effectively no chances until the introduction of Payet in the second half, after which they made 5 shots compared to the previous 2. West Ham struggled to create before Payet’s introduction in the 67th. After West Ham’s James Collins’ equalised the score, Conte reacted by making three substitutions in the attacking areas. Willian and Hazard made way for Pedro and Moses whilst most importantly, Michy Batshuayi was introduced for Oscar, meaning Chelsea switched to a 4-4-2. Their attacking rhythm increased immediately with a much more direct ball circulation being made as Chelsea looked to reclaim the lead. A greater emphasis was placed on getting the ball into the box, with more aggressive attacking from the wingers and a much greater number of long balls being made into the two strikers. Now paired by new signing Batshuayi, Costa and Chelsea had a much better chance of winning first and second balls when going immediately direct to the attack. This is exactly what happened for the winner, as the Belgian striker won the first ball and was able to knock it down to Costa, who pushed the challenging Collins away and made an excellent finish to Adrian’s bottom right corner. Although Chelsea only just managed to clinch victory in their season opener, there were a number of promising signs in Conte’s Premier League debut. The coherent attacking strategy worked well, despite ultimately not creating a great quantity of chances. The wing focus saw Hazard put in a performance closer to what we know he’s capable of, whilst the (albeit simple) in-game management of Conte led to Chelsea reclaiming the lead late on and ending with all three points. West Ham showed their reliance on Dimitri Payet throughout the match and the attacking strategy around Andy Carroll was largely ineffective. However the reaction upon the French winger’s entrance was a promising sight and he’ll undoubtedly be their central figure for another season despite the signings of Andre Ayew and Jonathan Calleri. Can you post an analysis of either of Chelsea’s 2 last games please. Want to know if anything mentioned in this article gas been worked on/improved by Conte and the squad. I think conte is going to put the team spirit back into chelsea players which they lacked last season, beside that the team doing well with a 4141 formation, the only concern is Matic more prefered to start than Fabregas ? which i believe no. But I am sure conte will work on that. Do you think that Oscar is better than Fabregas in that system? And another good point, as you said Hazard is a more agressive player, but some people say that he is also creative, but i get confuses what is creativity? Make a lot of dribbles? Make a lot of good passes? How do i see in a football game that a player is creative? creativity is about picking those high risk high reward passes very well. A creative player does it so it looks easy because he has technical speed. He thinks fast and picks out that pass when the defense has lost a little bit of structure. In my opinion, Conte is prioritizing defensive aspects at the moment. In that case Oscar is the better player. But I believe as the team gets better with his way of playing, Fabregas will replace Matic.